There is no shortage of restaurants, bistros, cafes or bars in Leicester allowing you to enjoy fantastic food from around the world. So forget about deciding whose turn it is to drive or where's best to park, let Limos Hire Leicester take those hassles away. Leicester was declared Curry capital of Britain for 2007 with its diverse and thriving Asian community the city has the density of Asian restaurants in the country. Melton Road hosts some of England's most delicious and mouth-watering Indian cuisine. A good place to start sampling is Leicester's golden mile on Belgrave road, the heart of the city's Asian community. If you are vegetarian, Leicester has an impressive selection of eating places to cater for your dining needs. The Good Earth is the cities longest established whole food restaurant, and on Friday evenings they provide live music. Blossoms, The Hayrick and Bread and Roses all offer excellent vegetarian meals, and Bobbys on Belgrave road has been serving Gujarati vegetarian cuisine for over 30 years, but you might also try Sonal's, Sayonara or Sharmilees for a mouth-watering choice of Indian vegetarian restaurants. 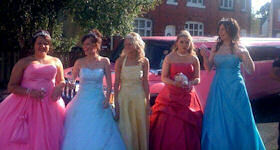 Have Limos Hire Leicester drive you and your guests to a food festival. There are Food festivals that take place annually during September and October. 'Leicester Food Fortnight' is held across venues in Leicestershire, celebrating the best food the county has to offer, farmers markets, tasters, demos, harvest festivals and restaurants. 'East Midlands Food and Drink Festival' is held at Brooksby Hall, hosting over 200 exhibitors displaying the best food and drink the East Midlands has to offer. This festival includes celebrity chefs' demonstrations and exhibitions such as BBC TV Chef Anjum Amand 'Indian Food Made Easy', Rachel Green, Clarissa Dickson and many more. 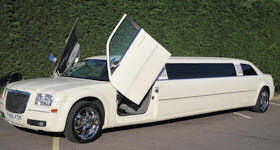 What ever your choice for dining out is it will be extra fun by being driven to your restaurant in a limousine. 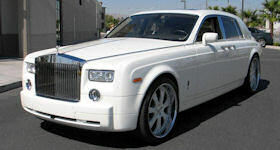 We offer you many limousine choices, our American Stretched Exotic Limos, Lincoln Town Car, Super Stretch Hummer or Range Rover Sport Limo that will provide you with a unique dining experience. During the journey to your restaurant we will allow you time to enjoy your limo and use its number of gadgets such as the DVD player, CD player, Disco lighting system, Flat screen TV and refreshments from the complimentary bar i.e. a soft drink or glass of champagne. Let us chauffer you and whilst you relax and enjoy your meal, we will be ready to collect you from your restaurant and safely deliver you back to your home.